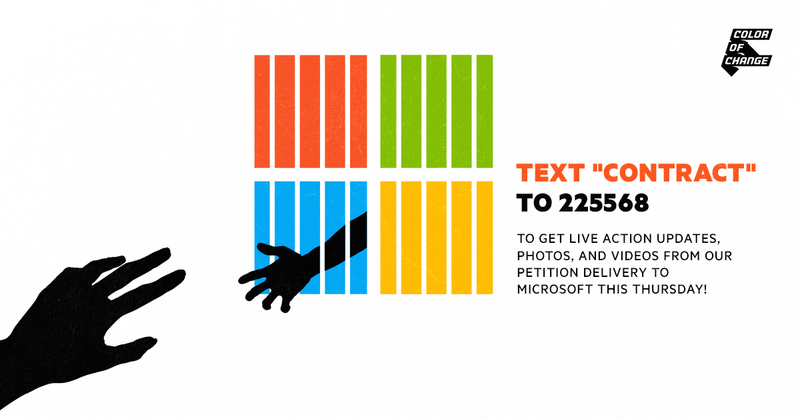 LARENCORE: U.S : Watch our Microsoft petition delivery as it happens today ! U.S : Watch our Microsoft petition delivery as it happens today ! Today, Color of Change and our partner organizations are delivering petitions with over 300,000 signatures to Microsoft. We demand that CEO Satya Nadella cancel Microsoft's $19.4 million contract with Immigration and Customs Enforcement (ICE). We couldn't have done this without your support for the #CancelTheContract campaign. I wish you could be there with us -- but I still want to keep you updated, even if you can’t come. Grab your phone and text “CONTRACT” to 225568 and we’ll send you a few photos and video updates during the petition delivery. In solidarity with tech workers and impacted communities, we will ask Microsoft to put people over profits and #CancelTheContract. Stay updated as we deliver the petition today by texting "CONTRACT" to 225568.